Spending quality time together is precious, although we live together myself and my mother both work full time and have busy social lives to balance, sometimes the only chance we have to catch up during the week is whilst watching the TV show Neighbours. I am a very family orientated person and cheesy as it sounds my mum is one of my best friends, she’s always supportive and there to listen to me and often talk some sense into me! To ensure we could spend more mother daughter days together for Christmas a few years ago, my brother and father bought us both membership to Nirvana Spa and it’s a tradition that’s carried on ever since. With six visits across the year we can go together, catch up and switch off from the outside world for a couple of hours. Most of the photos in this blog post are actually of my mum rather than me and I’m sure you’ll agree she’s the definition of someone who’s beautiful inside and out! Nirvana Spa is located close to Wokingham and a 40minute drive from Guildford in Surrey. It’s relax, revive, indulge slogan is very apt with majestic architecture, a stunning floatation room, a relaxing ambience and tasty food. Nirvana Spa is the place to go to meet up with loved ones whether that be quality time with friends, precious mother-daughter time or spending the day with your partner. It’s a place where you can switch off from the demands of everyday life and reconnect. 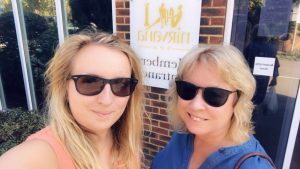 We first visited five years ago after a recommendation from one of my mum’s friends at work she’d described it as the perfect place for mother and daughter time. From our first visit we fell in love with Nirvana Spa, the staff are friendly, the food is tasty (now so more than ever before) and the whole environment is stylish, elegant and blissful. 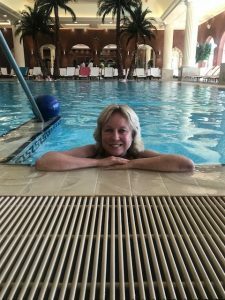 It has a nice combination of pools, heated loungers, relaxation areas, saunas and treatments carried out by highly trained therapists, not forgetting my mum’s particular favourite the heated jet pool and mine the outdoor Jacuzzis. Our visit on the 4th August, fell at exactly the right time for many reasons. It had been a tough and difficult couple of months for our family; my mum suffered a serious injury to her pelvis, my grandfather passed away and my brother’s wedding on the 8th had brought happiness of course – but a lot of last minute stress and worry especially for my mum (everyone just wants things to go well). And our most recent visit on the 16th September was a welcomed respite, a little treat and time to relax together after my Grandma’s recent admission into hospital. Whatever life throws at us Nirvana Spa is always a blissful place to rejuvenate our minds. With a friendly welcome from the reception staff and concierge desk we collected our soft Egyptian cotton robes and towels then headed to the changing room to get changed. There are several changing areas throughout the spa, so you have plenty of space to get ready and leave your belongings. Our first point of call for the day was breakfast, we opted to sit outside on the new pergola area. With temperatures predicted to reach 30 degrees during our visit, the shade was a welcomed place to sit. 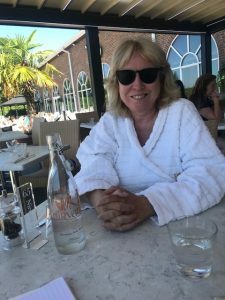 It was glorious sitting enjoying breakfast whilst overlooking the outdoor pool and other guests making the most of the sunshine – it felt like we’d been transported to the Mediterranean not Wokingham. It’s very rare that myself and my mother get the chance to sit down together for breakfast there are only two times when we do; on holiday and during our spa visits to Nirvana Spa. It seems I can’t ever get rid of that little mud-loving child inside; when I was little my mum would tease me for playing in the mud, As I got older I’d buy mud face masks for their renowned complexion benefits, then came the pretty muddy 5k and most recently my rasul treatment with my mum at NirvanaSpa. It’s something you definitely need to try together on your spa visit – the Rasul treatment for two, Nirvana Spa have several options to choose from with packages available including lunch as well. It’s a fun and bonding experience for mother and daughter to enjoy together and a great idea for Christmas, birthday or mother’s day gift. But what is Rasul? Rasual is an ancient mud therapy with historical routes in Egypt, Arabia and Morocco. Using mineral mud to relive rheumatic issues, soothe aching muscles, target dry skin, soothe eczema and promote blood flow and clearer complexion. We were explained the qualities of each product and the step by step process by one of the lovely spa therapists and then left to enjoy the experience in our own private room. Rub the salt scrub all over your body in a circular motion for an invigorating way to exfoliate your skin. Then after five minutes wash off with a hot shower – how silky soft does your skin feel already?!! Apply the hydrating face mask to produce a more radiant and youthful complexion. Next it’s time to treat your hair and scalp, we ply our hair with so many chemicals day in and day out that giving them something natural and rejuvenating is a well welcomed treat. For a soothing and restoring benefit massage the scalp mud mask into your roots, scalp and hair. Then soothe the black body mud into the rest of your body especially targeting any areas of dry skin like knees, elbows or feet. Pop into the steam room until the light changes orange and then shower it all off! We loved having a private area to ourselves, we laughed and joked as we covered ourselves in the soft silky mud. After sitting in the steam room to exfoliate our skin we showered off and remarked on how soft and smooth our skin and hair now felt – it was such a rejuvenating experience, we’d love to try it again. And you can buy all of the products from Nirvana Spa to use at home. I fell in love with the salt scrub so much I plan on buying it next time I visit. Now feeling totally relaxed and at ease with our worries seeming miles away we strolled to the outside area to soak up the sunshine on a lounger, we chatted about the usual things; updates on friends, boys and any fun gossip articles we came across in our magazines and our plans for the rest of our spa day together. After we got a little bit too overheated, being English Roses, we tend to turn into tomatoes in this extremely hot weather he opted to sit by the main pool. This is one of our favourite places in the spa, there are plenty of loungers to choose from and the palm trees give it a tropical ambience. I took a refreshing dip in the pool going for a little swim whilst my mum called down in the water (she’s still recovering from her injury or we would have swum together). We also like sitting by this pool as it gives you the chance to watch the world go by and see other mothers and daughters enjoying their spaday together. For lunch we sat outside under the pergola again, there are some really lovely summer touches to the drinks and food on offer at Nirvana Spa; ice creams, outdoor BBQ, Pimm’s and the new summer menu designed by head chef (all of which I discuss more in my upcoming food blog post). Over lunch we caught up on our hopes for the months ahead and inspired by the gorgeous food we discussed attending a cookery course at Applegarth Farm another activity for us to enjoy together. Before our manicures we decided to visit my mum’s favourite place; the water jet pool somewhere we always visit. This heated pool contains various water jets perfect for easing aches in pains all directed at different heights and angles. Some are ideal for neck aches and other jets perfect for targeting lower back pains, this pool was especially appreciated by my mum this visit as she has been experiencing a lot of leg and pelvis pain following her injury. Afterwards we relaxed on the heated ceramic loungers and enjoyed a little nap – this room is so peaceful and tranquil with the only sound being the trickling of a water feature, utter bliss. Leaving the tranquil spa behind we walked along to the treatment area, there is a vast variety of treatments for you to choose between from manicures and pedicures to massages. We have experienced a Swedish back massage before and hope to try a hot stone massage on one of our future visits. During our recent visit though we had booked a gel manicure for each of us in preparation for my brothers wedding. 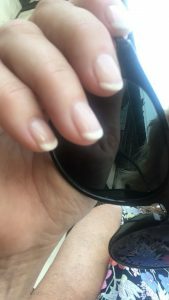 The therapists were lovely, chatty and friendly and carried out French gel manicure for both of us, another great way to spend time together as our bookings were arranged so that we ended up sitting next to each other! Sadly then it was home time for us…. Our August and September visits were incredible, the food was stunning, the rasul treatment was lovely and the best part was getting to experience it all with my mum (and we can’t wait to come back again in November!). We’d like to thank the wonderful staff for looking after us so well during our spa day. If you are looking for the ultimate spa experience for some mother daughter time, Nirvana Spa is the best place to visit. There are several experience options for you to choose from and several are unique to the spa for example the floatation and I know you will come home feeling relaxed and closer to each other than ever. Keen to learn more about the tantalising cuisine at Nirvana Spa? How about taking a look at all the food, drink and special dietary dishes at on offer at Nirvana Spa. This sounds like heaven and what an amazing yearly gift to get!! Such a great idea 🙂 I love going to the spa and 6 visits a year would be perfect! I also love that you and your mum are so close and you can enjoy this together 🙂 If I’m ever in the Surrey area, I’ll be sure to look up Nirvana Spa! It genuinely sounds and looks wonderful! We are very close its nice to find things to do together and switch off from everyday life! I’m glad you enjoyed the post Joannda it’s very close to Reading in Berkshire so if ever find yourself in the area and keen to relax you won’t find a more blissful setting! I have never been to a spa, but this sounds like the perfect relaxing experience. Even more so since it allows you and your mom to catch up. You both look beautiful! It’s so wonderful that you have such a close relationship with your mom and that you do get to share these times together. The relationship you have with your mom is so heartwarming, Elle! I’m glad you can experience days like this together.